It's summertime, and the living is easy. For speed cleaning, stock cleaning tools and supplies in a basket or lightweight caddy that's easy to tote from room to room. Cleaning should be easy as well, but often it isn't. Dust collects on countertops, kitchens build up grease and grime and the bathrooms - well, we all know what summer can do to bathrooms. With work, kids and leisure pursuits all competing for your attention, why devote any more time to cleaning than is absolutely necessary? These home cleaning tricks can help keep summer cleaning time to a minimum. Get organized. Stock cleaning tools and supplies in a basket or lightweight caddy that's easy to tote from room to room. Clean smart. Learn the clockwise cleaning routine: Begin at the door and clean from top to bottom, moving clockwise around each room. This smart approach ensures that you'll attend to a room's every surface in a single pass. Break down big weekly chores into smaller daily tasks. Instead of waiting until the weekend, when you're likely to find something better to do than clean house, break down the big chores into smaller daily tasks. Clean the microwave Monday, the toilet Tuesday, mop the floors Wednesday, and tackle the tub Thursday. By Friday, your big target areas - the kitchen and bathroom - are nearly done. A few minutes on Friday surface duty, and your home is clean and the weekend is yours. You'll also need the right cleaning tools: a long-handled scrub brush, scrubber sponge, microfiber cleaning cloths and paper towels. Save time by spraying cleaners on areas that will benefit from some extra soaking time - such as the toilet and tub or shower - and tackling other surfaces while the cleaners do their work. By letting the cleaners penetrate, all you'll have to do to most surfaces is wipe them clean. To make your job easier in the future, keep a bathroom squeegee like this $15 one from OXO in the tub or shower for quick wipe-downs of the shower walls and door or the sides of the tub to prevent soap-scum buildup. To keep mildew in check, open the shower door or curtain after use to let it air-dry. Put a finishing shine on your shower, tub and sink fixtures by giving them a once-over with a glass cleaner and a microfiber cleaning cloth. 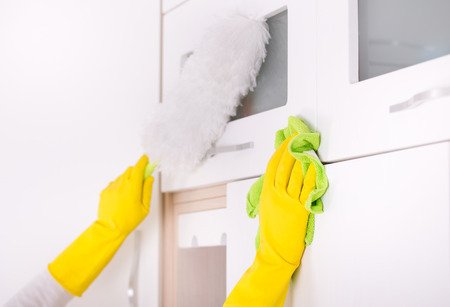 For the kitchen's potluck of dirt, grease and germs, you'll need an all-purpose cleaner; hand dish-washing detergent; a clean, dry cloth; and a scrubber sponge. Start by putting away anything that's out of place, such as the kids' art projects or mail that has taken up residence on your kitchen table. The clockwise cleaning method is the quickest and most effective way to clean the kitchen. Send oven mitts and dish towels into the wash. Don't waste your precious time scrubbing dried-on foods or baked-on spills on the countertops or stove - instead, give them a generous spritz of all-purpose cleaner. Allow the cleaner to penetrate the grime while you move on to the (cool) oven. Remove the racks, and scrape off any burned-on gunk with a dull knife. Use an oven cleaner or, if you have a self-cleaner, simply turn it on and let the appliance clean itself. For baked-on messes in the microwave, apply hand dish-washing detergent using your scrubber sponge; rinse clean with a damp sponge. Spot-clean countertops, the oven exterior, cabinets, dishwasher and refrigerator by spraying on an all-purpose cleaner and wiping clean with a dry cloth. Finish the job by sweeping the floor to get rid of corner crumbs; then mop your way out the door. Move clockwise around each room, putting away surface clutter and mislaid items. Stash outside the door any stuff that doesn't belong. Dust shelves, windowsills, miniblinds, lamps, tables, bureaus and TV screens with a clean, damp cloth. Don't use a feather duster - it just sends dust into the air, and it eventually will settle back down where it came from. Vacuum upholstered chairs and sofas, and take decorative pillows outdoors to shake off the dust, or fluff them up with a 10-minute tumble in the dryer. Change bed linens. Finish with a quick surface vacuuming, and spend a few extra seconds vacuuming near the doorways. Now relax and enjoy - summer fun awaits!